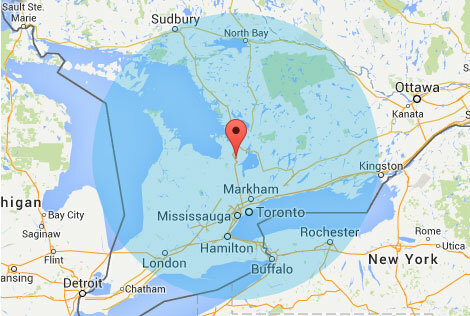 Our service area covers, roughly, a 250KM radius from our office, which is located in Barrie, ON. We primarily service the GTA (Greater Toronto Area), but regularly travel to the extends of our area. As you can see in the map below, our standard service area covers from London in the West, to Kingston in the East, Niagara Falls to the South and Sudbury to the North, but we will travel to any place you need us! Contact us at any time to discuss pricing. Are you looking for service outside of our primary area? We have a network of affiliates right across the country who are ready to assist you!